Ingrown Toenail Treatment | Ocean County Foot & Ankle Surgical Associates, P.C. As foot and ankle specialists, we treat different conditions affecting the foot, ankle and leg. These conditions can be very minor, but annoying problems affecting one's personal quality of life. However, at times, more severe conditions especially relating to underlying illness such as diabetes or traumatic injuries can be limb or even life threatening. When the corners of your toenails curve and dig or even grow into the soft tissue on the sides of the nail, it can cause painful irritation with noticeable redness and swelling. This condition is called onychocryptosis but is commonly referred to as an ingrown toenail, and it’s one of the most common nail impairment. 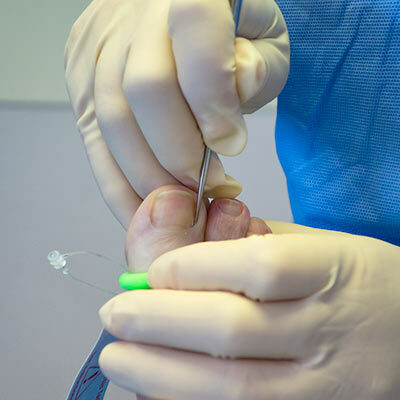 If you’re suffering from an ingrown toenail, our experienced team of board-certified foot and ankle surgeons provides a variety of treatments to help with the related pain, swelling or infection. The most common location for ingrown toenails is the big toe, but any toe can suffer from this affliction. You can develop an ingrown toenail when you improperly trim your nails, which should always be trimmed straight across. Wearing shoes that crowd the toes, heredity and repeated trauma to the feet are also common causes. Discomfort from ingrown nails can become quite painful as the nail continues to grow into the flesh. Left untreated, you may notice drainage and odor due to infection, which should be addressed immediately. Never attempt to remove part of your ingrown toenail at home or use over-the-counter medications to treat your condition. Make an appointment with our knowledgeable foot and ankle specialists if you notice any drainage or pain prevents you from walking or doing other activities. Patients with diabetes or other circulatory disorders should seek treatment immediately to prevent more serious complications from occurring. Severely ingrown toenails may require minor surgery to alleviate the condition. Nail problems should always be evaluated by our foot and ankle specialists. We can diagnose your ailment to determine the most appropriate treatment. We may remove the part of the nail growing into the skin. To treat infection, we prescribe topical and/or oral medications. If you suffer from chronic ingrown toenails, we can also perform a procedure to permanently prevent them from reoccurring.